The Cassini Ultraviolet Imaging Spectrograph (UVIS) is part of the remote sensing payload of the Cassini orbiter spacecraft. UVIS has two spectrographic channels that provide images and spectra covering the ranges from 56 to 118 nm and 110 to 190 nm. A third optical path with a solar blind CsI photocathode is used for high signal-to-noise-ratio stellar occultations by rings and atmospheres. A separate Hydrogen Deuterium Absorption Cell measures the relative abundance of deuterium and hydrogen from their Lyman-α emission. 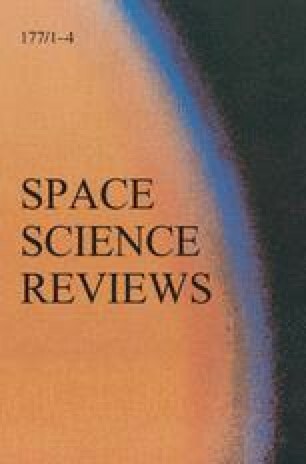 The UVIS science objectives include investigation of the chemistry, aerosols, clouds, and energy balance of the Titan and Saturn atmospheres; neutrals in the Saturn magnetosphere; the deuterium-to-hydrogen (D/H) ratio for Titan and Saturn; icy satellite surface properties; and the structure and evolution of Saturn’s rings. This revised version was published online in July 2005 with a corrected cover date. 1.University of ColoradoLaboratory for Atmospheric and Space PhysicsBoulderU.S.A. 6.University of Southern CaliforniaDepartment of Aerospace EngineeringLos AngelesU.S.A. 7.California Institute of TechnologyDivision of Geological and Planetary SciencesPasadenaU.S.A.